1861 O $20 AU55 PCGS available in the Heritage Signature Auction in Orlando, July 11-14 2013. �����The tumultuous downward trend in the price of Gold has had an effect on sales of modern bullion coins. So much so that the U.S. Mint is considering lowering prices on gold products (as well as platinum, and possibly silver) to counter falling metal prices and to entice sales. As bullion prices have steadily dropped over the last several weeks, dealers have shifted their focus from bullion related products to earlier rarities. �����With the recent decline in Gold Bullion, common U.S. Gold coins have seen a considerable drop in FMV over the last few months. However, better date U.S. Gold coins are seeing higher premiums. The chart below shows the huge advances that have been made since January of this year for specific dated $20 Liberties. �����These coins are considered rare and very difficult to acquire. In some cases, a large increase are a result of a coin coming into the marketplace that has not been available for quite some time. But these coins are not that difficult to identify. If you study the population reports for PCGS and NGC you can see that most of these coins have less than 25 coins certified in the specific grade and five of them have less than twenty coins certified in all higher grades. �����Below is a list of 24 dates of $20 Liberties that have increased since January within the AU50 through MS61 grades. 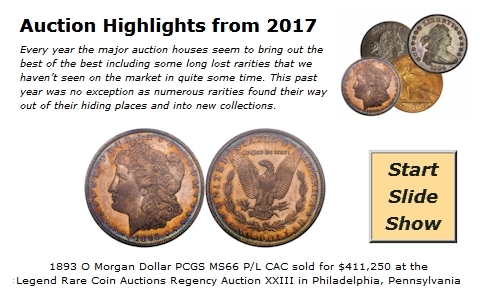 A few coins from the Philadelphia and San Francisco Mints are included, but what we found was that this list consisted mostly of New Orleans and Carson City minted coins. This should not be a surprise to aficionados of this series. These coins have been in steady demand for a couple of years now and you rarely see many of them in dealer inventories. �����Only one coin in this group had an original mintage over one million coins and that was the 1856 S with 1,189,750. 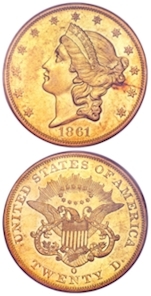 The lowest mintage was the 1885 with only 828 coins. However, looking at the population reports on these coins, the common element is that the AU�s have a hundred to two hundred coins total certified and the total number of Mint State coins typically shows less than 100 coins. In most cases, the highest grade is MS63 with just a few dates that have an MS64. �����Some of the Carson City dates listed above do have a large number of AU coins, but most of these have very few Mint State coins. For example, the 1879 CC has a total of 288 AU coins certified, but there is a mere 17 coins in all of the Mint State grades with the highest being MS62. The FMV for the MS62 is $89,050; in July 2011 the FMV was $63,050, up $26,000 in two years. There is tremendous potential for coins that have small populations and multiple aggressive buyers who want coins from the highest grades. �����The FMV for the 1878 CC has increased in AU50 through MS62 since the beginning of the year. The AU50 has increased almost 14% from $10,190 to $11,590; and the MS61 jumped from $50,050 to a higher $61,750, an increase of about 23%. These are the types of coins that advanced collectors and investors are searching for in today�s market. �����Nevertheless, there are other dates within the $20 Liberty series that have potential for future profits. The Type I and II Twenties are very popular, and comparing the population reports for individual dates will reveal the potential availability of every grade. When searching for a specific grade many collectors look at the population and FMV for that grade as well as the values and the populations for the grades above it. Sometimes you may find a higher grade coin that fits your budget at a relatively small percentage over the lower graded coin. �����Despite the metals recent fall, there are numerous other series with better than average appreciation and potential for the future.